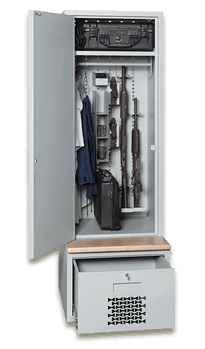 M1 storage lockers come in a variety of sizes and are perfect for squads, teams, and units that need to store a combination of weapons and gear. This isn't your average "Locker Room" locker! The exterior design completely hides the contents of this locker with double-layered door. The unsuspecting person would never guess this locker safely stored guns and other weapons! 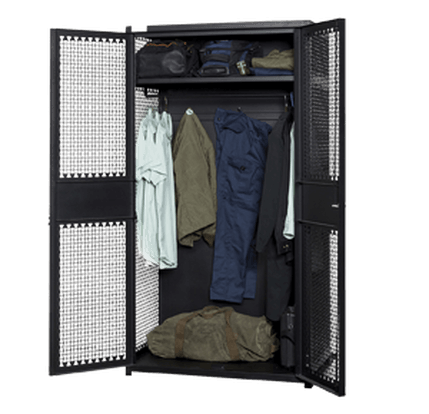 The TA-50 locker's open, yet secure design makes it a great solution for storing gear that needs airing out. 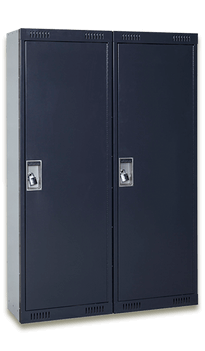 Tactical Lockers feature double-wall doors, roll-out boot drawer, a solid wood seat, and a ready-to-customize interior -- perfect for gear and weapons used by S.W.A.T., Police, Fire and Emergency Response Teams.